Roosevelt is a station on the Chicago Transit Authority's 'L' system, located in between the Chicago Loop and the Near South Side in Chicago, Illinois. It is situated at 1167 S State Street, just north of Roosevelt Road, and serves the Red, Green and Orange lines. The station is also the closest 'L' station to the Museum Campus of Chicago and Soldier Field, which are about 1⁄2 mile (800 m) to the east. The Museum Campus/11th Street Metra station is also about 1⁄3 mile (500 m) to the east. An elevated station at Roosevelt Road opened on June 6, 1892, as part of the Chicago and South Side Rapid Transit Railroad, the first elevated rapid transit line in Chicago. From 1919 to 1963 interurban trains of the North Shore Line also used the station. 'L' service through the station was discontinued in 1949 when CTA routed all trains from the Englewood and Jackson Park branches through the State Street Subway, using the 13th street portal, forming the North-South Route (a precursor of today's Red Line), and following the bankruptcy of the North Shore Line in 1963 the station was closed completely and demolished. 'L' service resumed passing the site of the original station in 1969 when the CTA began to route Dan Ryan trains into the Loop and a new elevated station was constructed in 1993 as part of the construction of the Orange Line. The subway station at Roosevelt Road opened on October 17, 1943, as part of the State Street Subway. 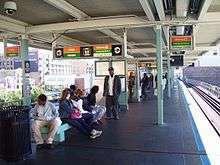 In 1993, when the new elevated station was constructed it was intended that there should be a direct link to the subway, however, due to lack of money this was not initially built. In 2002, the stations were finally linked as a single facility through the Roosevelt transfer tunnel. ↑ "Running on the "L."". Chicago Daily Tribune. June 7, 1892. p. 9. ↑ Shinnick, William (October 17, 1943). "Chicago Underground—A Subway at Last!". Chicago Daily Tribune. p. C1. ↑ "Roosevelt". Chicago Transit Authority. Retrieved October 11, 2012.